Last March 24, I received a message from the amazing Daryl Chang of Preview Magazine for a possible project–another editorial for Preview Magazine’s June issue. Woohoooo! Of course I got all excited again and said yes. I was told the fashion editorial is about “decade icons”. The icon assigned to me is Cher (the mother of all beckies before Madonna and Lady Gaga came along) of Sonny and Cher from the 60s. The trend is FRINGE, color should be gray and plain, and the silhouette has to be long. 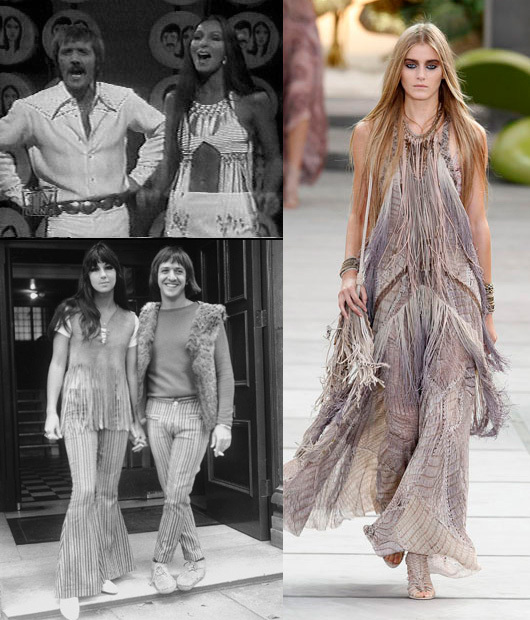 So basically, make a Cher-inspired outfit modern, ala Roberto Cavalli SS2011. Here’s the clincher, in true Preview Magazine fashion, deadline is 5 days after. OH EM. Goodluck! So ready-made fringe it is. But of course (again), in true Camille fashion, something just had to go wrong. For two days I searched for gray-colored fringes and nada! I practically turned Divisoria upside down, even tried to order bundles but even wholesale suppliers were out of gray-colored fringes. I was even thinking of using other materials but they were just too ugly. It was so frustrating that they had fringes in bright orange, purple, bright green, pink, royal blue and more, just not gray. WHY!!!! So I quickly called Daryl up and told her my dilemma. We settled for light blue instead, it was the nearest to gray and easiest to manipulate into resembling gray. As seen on Preview Magazine’s June 2011 issue, well-loved drag queen/celebrity, Vice Ganda, as both Sonny and Cher. If you’re wondering if I was informed that celebrity Vice Ganda is to be the model, then no. I had no idea!!! When I received the measurements, I was actually wondering why it wasn’t the usual model size. I thought she was just really tall and possibly Western, so she’s bigger-boned. I only found out weeks after when I made another costume for Vice Ganda and noticed that the measurements were the same. How cool is this? Vice Ganda is the first ever drag queen to be featured in a Preview fashion editorial. On to the design, the whole upper half (minidress length) of the gown is covered with fringes. Sucky you can’t really see the other details but there are cut-outs on the sides of the waist, beneath the horizontal fringes. The fringes at the top center forms “V” shapes while the fringes on the lower half formed the opposite, mixed with a few loose horizontal fringes. I got a sheer light blue printed fabric for the skirt. The print kinda resembles water, yes? Because the dress has a long silhouette, I wanted to add a touch of subtle sexiness to it hence a little skin here and there. Still can’t help thinking how much better this would look with real thread. But then again, I wouldn’t be able to finish on time if I did use thread. Oh well!